COMIC NEWS! 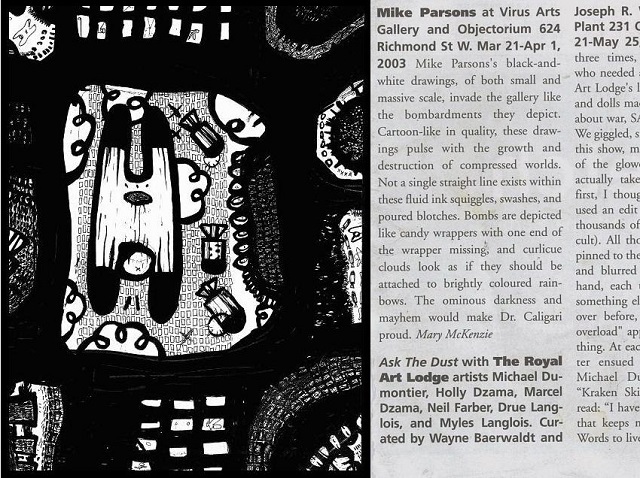 Mike Parsons black and white drawings of both small and massive scale, invade the gallery like the bombardments they depict. Cartoon-like in quality, these drawings pulse with the growth and destruction of compressed worlds. Not a single straight line exists within these fluid ink squiggles, swashes, and poured blotches. Bombs are depicted like candy wrappers with one end of the wrapper missing, and curlicue clouds look as if they should be attached to brightly coloured rainbows. The ominous darkness and mayhem would make Dr. Caligari proud. BLOG T.O. Hey Look, It's a Mike Parsons! BLOG T.O. JUNE 26, 2007 COMIC NEWS Mike Parsons has been drawing these sorts of dense, busy black on white images for as long as I've known him. Themes involving the choking mess of city life, slavery to consumerism and the threat of total obliteration by war have always been prevalent, but that's not to say Parsons ever really repeats himself. The mural shown above (and below the cut) can be found at Bathurst and Wolseley. 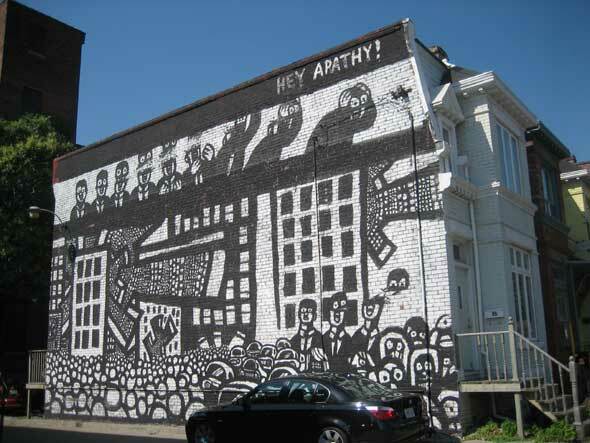 A number of other murals can be found around Kensington Market and elsewhere in the city. It's the kind of graffiti that really grabs your attention and makes you look. The images are so simple, and the color is so stark it's impossible for Parsons' work to blend into the surroundings. Although sometimes the surroundings blend into the work. COMIC NEWS! Mike Parsons has been an iconic fixture on Toronto’s trendy Queen West for more than 10 years. 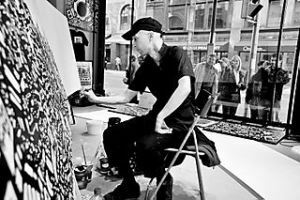 A street artist, performer, comic book creator and clothing designer, he can be found on any given day outside the Black Bull tavern, putting black ink to canvases the size of books, or the size of the sidewalk, itself. Parsons’ newest collection is Hey Apathy!, which he describes as an “artistic investigation into the metropolis, people, monsters, and the mechanics of being.” In other words, through his pieces, he explores philosophical and existentialist questions. Just what IS a city? Who are all these people? Where do I fit in? How is it all related? What’s interesting is that his art attempts to answer these questions through stories. Some are full-page paintings, others are broken up into panels. A piece I picked up from him last summer is about a war between mother nature and the concrete jungle, the end result being mother nature destroying the city with furious vines she harkened forth with her mighty drum. Eventually, Parsons takes his ink paintings and makes collections and comic books out of them, and others are silkscreened onto shirts. He also does commissions – quite a few walls in Toronto are adourned with his paint, and the Art Gallery of Ontario also commissioned him to make limited edition shirts for their re-opening in 2008 (they underwent a major facelift). Dig him? Check him out here. Or come visit Toronto this summer and look for the guy in black sitting under a tree.